Grandma Celeste is at the heart of TLC, she started working as a milliner at the age of 13, and has now been in the industry for over 5 decades. 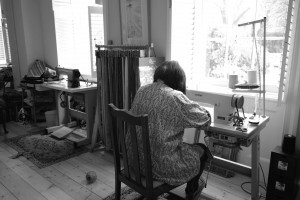 She brings our ideas and collections to life with her master sewing skills and incredible eye for detail. I grew up in this creative environment and was immersed in the family business, which Celeste set up. I picked up my Mum’s craft at an early age, regularly helping out with a needle and thread. My daughter Brontey has been developing her artistic talent for fabric and textile design for many years. 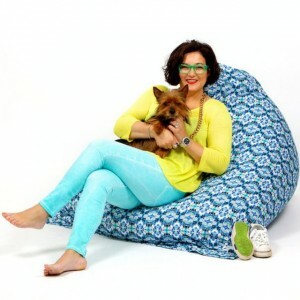 She is the creative genius who sparks beautiful ideas for TLC fabric collections and makes them come to life. 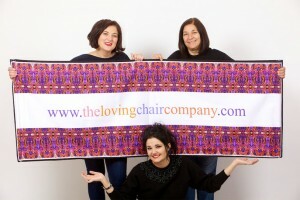 Together we launched The Loving Chair Company website in May 2012. In terms of the business I’m driven by creating a legacy for my family – continuing the trade that my mum is so skilled in, and allowing the talents of other members of the family to add to that and create something successful and lasting. In my work, I’m inspired by taking an old or antique object that has its own history and making it into a new version of that object that will make new history and memories in a different environment. 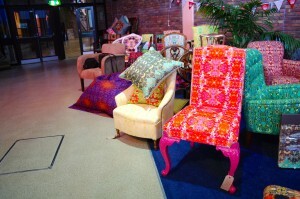 And, as you can tell, we love colour at The Loving Chair Company! I usually start the day visiting a potential new customer, helping them with fabric choices or giving them some design ideas for their home or work place. Then it’s home for a cup of tea followed by anything from stripping and sanding furniture to ordering fabrics, speaking to printers, sourcing upholstery equipment, getting involved in the design process and discussing what fabrics to use in our up coming projects. In typical cottage-industry style, the farmhouse barn is our workshop. Outside there may be stunning countryside views and the odd Jersey cow or two but inside you’ll find the team busying beneath a dust cloud. We are also actively pursuing export opportunities for our unique furniture. 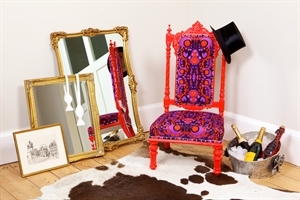 When Liberty of London hosted their Best of British Open Call 2013, we went along to the Home Furnishings section, with our fabric books, look book and a miniature Louis the 14th sample chair in tow. Store Managing Director Ed Burstel was interested in TLC’s Jersey Bean Bags, you can read more about our visit to the iconic London store on our blog. All our products – furniture and soft furnishings, are available on our website, www.thelovingchaircompany.com. Here you can also get an idea of the upholstery service we provide but for more information please contact us through our website or by phone. We look forward to hearing from you. 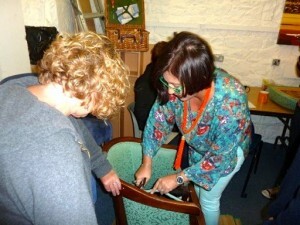 "Like" The Loving Chair company on their Facebook Page to find out about new projects. They also have a permanent exhibition space in the Harbour Gallery, St Aubin.